SquareTrade is a warranty company that services laptops, among other products. 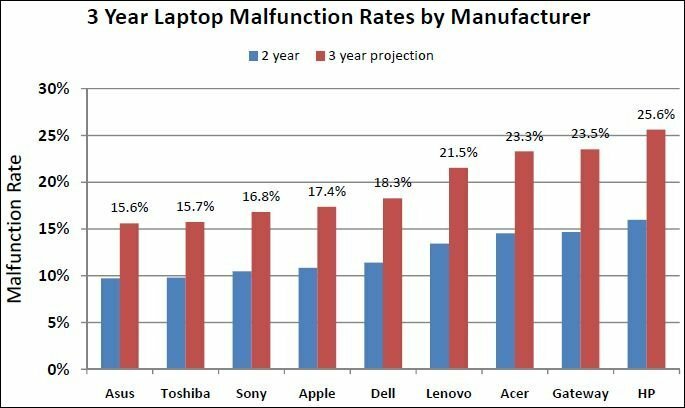 The company studied laptop malfunction rates over 3 years to determine which were the most reliable. Of course, you don’t want to buy a laptop based on a single factor. You also need to consider price and features. For example, Sony products usually carry a price premium. And although Apple laptops are more reliable than average, they’re also expensive, and run the Mac operating system (although you can install Windows, if you choose). For more detail, read SquareTrade’s full laptop reliability report.